Choosing the claiming age that maximizes the expected present value of lifetime Social Security retirement benefits requires a survival function to account for an individual's prospective longevity along with the specification of a rate by which to discount the future benefit payments for each claiming age. This article evaluates optimal claiming ages for prospective beneficiaries across a range of 81 real discount rate options (specified in increments of one-tenth of 1 percent) from 0 percent to 8 percent, considering the survival functions for men and women born in 1952. It examines the implications of choosing a given rate as well as the sensitivity of the optimal claiming age to a specific rate choice. This note examines how changes in women's labor force participation and lifetime earnings will affect the Social Security benefits of future beneficiary wives. 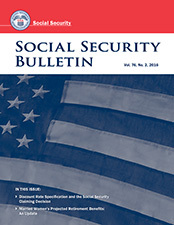 The Social Security Administration's Modeling Income in the Near Term (version 7) projects that at least four-fifths of wives in the late baby boom (born 1956–1965) and generation X (born 1966–1975) cohorts will receive their initial Social Security benefits based solely on their own earnings. For wives in those cohorts, most of the average benefit amount (91–92 percent) will be attributable to their own earnings histories.